TotallyYourType: WHAT'S IN THE BOX?!? 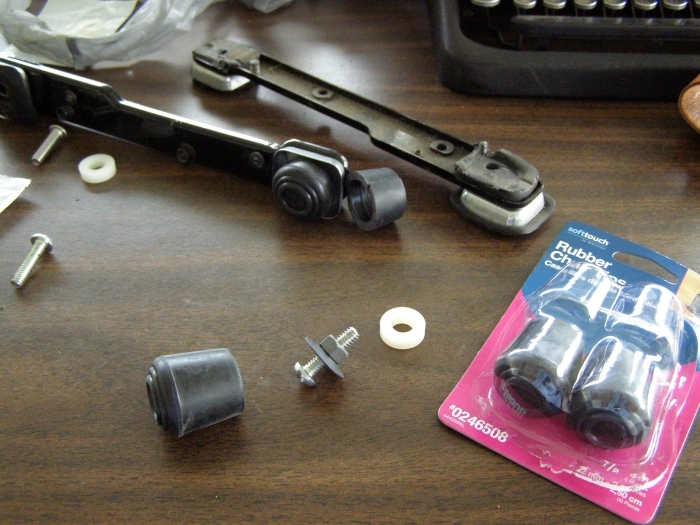 Rubber chair tips can be trimmed with a knife and the inner diameter made a snug fit with the strange cowboy hat looking screw. 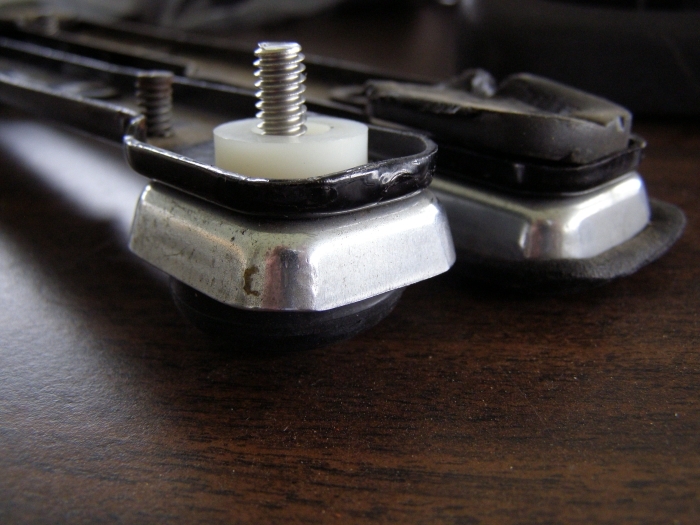 The new feet look much cleaner than the old ones and have great tabletop grip. Nice job on the feet. I have no idea about the box! That looks like a typical '20s or '30s handle, but ....? 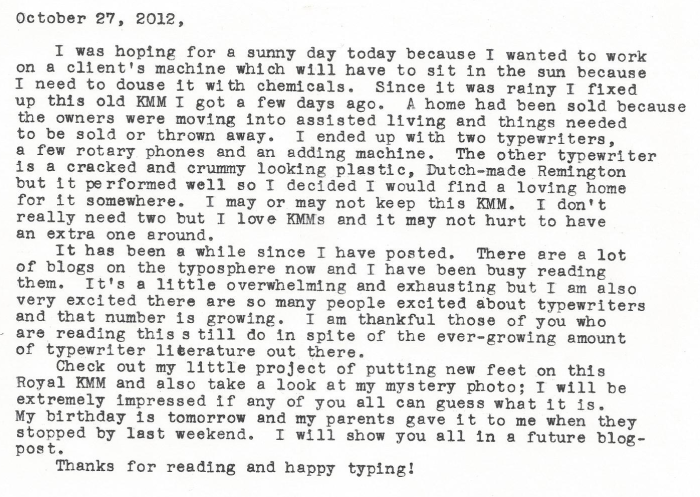 If it's a typewriter of some sort, I'm guessing something odd like a teletype. Box! I love boxes.... I love secret boxes! What is it? Ummm.... Okay, it has toughened corners, and a handle capable of handing a bit of weight - on an object that doesn't need to be kept too firmly stable. I agree with Richard that it's 1930's. There's a possibility of it being a typewriter toolkit. Hmmmmmmmm...... I need to think about this more. Who doesn't love boxes? Right? And this is an excellent one. 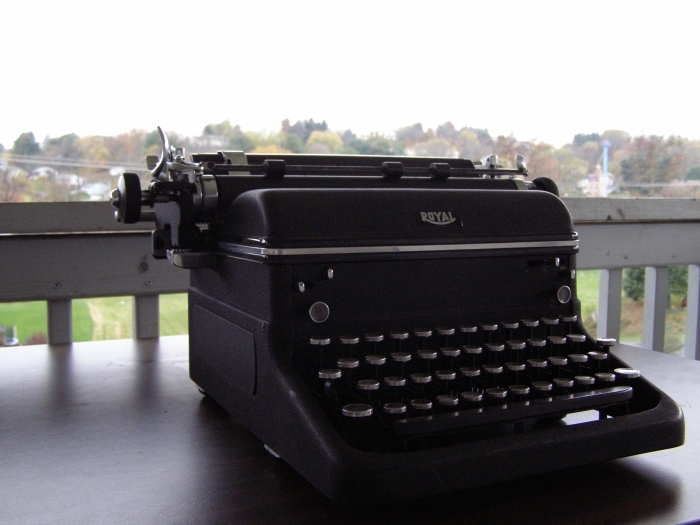 It is not a typewriter, but I feel like simply due to its age it deserves to be on the blog. What's in the box? My wild guess is a gramophone. Secret boxes are great! That is one VERY nice KMM. Is it a Singer sewing machine in the box? Ah, a classic KMM. I use corks to replace feet for the most part. Might the box hold an old dictating machine? That KMM types fantastically! The typeface is nice and clean, very attractive, and looks nice and small. 10 or 11 CPI? I really want to know what is in that box, damnit! Also, a Birthday to you, Mark! I don't think it is much smaller than a normal typewriter typeface. I'll show you all what's in the box soon. If not the next post, the one after. That's a promise, in my next two posts I will show you all what is in the box. A rather large, handsome, surprise box. For some reason I keep thinking that it's got a 1920's video recorder of some sort. Hmmm.